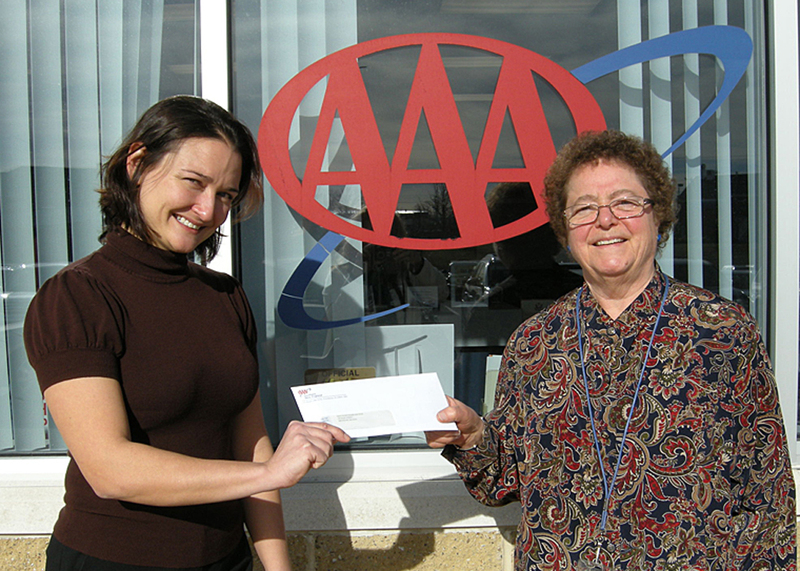 Krystal Brig, Branch Manager at AAA Southern New England in Plymouth presents Lucille Dallaire, Development Director at OCES, a donation towards OCES’ Emergency Fund Program. Old Colony Elder Services (OCES), a private, non-profit agency designated as an Aging Services Access Point (ASAP) serving the greater Brockton and Plymouth county areas, has received a total of $8,385 in donations to their Emergency Fund from the business community. AAA Southern New England, Affinity Home Health Care, Inc., Anodyne Homemaker Services Corp., Apothecare South Shore, Attentive Home Care, Inc., BC Tent & Awning Co., Inc., Best of Care, Inc., Blanchard Funeral Chapel, Bridgewater Savings Bank, Brockton Visiting Nurse Association, Crescent Credit Union, Cushman Insurance, Duval’s Pharmacy Inc., Entergy Nuclear Operations, Inc., Fitzgerald Appraisals, Geriatric Home Health Care, Inc., Greenlife, Inc., HarborOne Credit Union, Home Health Resources, Inc., HomeWatch Caregivers, K Cashman Group, Inc., Liberty Printing, Lindley Acquisition Corp. d/b/a Lindley Food Service, LiteControl, PMG Physician Associates, Right At Home, Robert Berks, Attorney at Law, Senior Whole Health, Shanahan Drywall & Plastering, LLC, South Coastal Bank, Tedeschi Food Shops, Trufant Real Estate, Inc., Walker Clay, Inc. and W.R.S. Painting. Last year, OCES’ Emergency Fund helped 253 low-income seniors and individuals with disabilities remain in their homes, including a 60 year-old woman who couldn’t pay for heating oil who stated “This is the first time in my 60 years on earth I’ve needed help. OCES was like Angels from Heaven. There is no possible way I could have made it through the winter without OCES. Thank you so very, very much.” Historically, the number of elders and individuals with disabilities in need greatly increases during the winter months, when home heating costs rise as the temperature drops. “Our Emergency Fund enables us to meet the needs of elders and individuals with disabilities who are in crisis or emergency situations that threaten their health or living status and cannot be addressed through the use of any other resource. These needs include fuel assistance, utility bill payments, short-term emergency shelter, medical transport, medications, air conditioners for individuals with breathing difficulties, hot water heaters, food and more. We are very grateful for the generosity of these businesses that have come to the aid of needy seniors and individuals with disabilities in our communities,” noted Diana DiGiorgi, Executive Director of OCES. Founded in 1974, OCES serves 20 towns in Plymouth County as well as Avon, Easton and Stoughton. OCES is a private, non-profit organization located in Brockton and designated as one of 27 Aging Services Access Points (ASAPs) in the Commonwealth of Massachusetts. The organization’s mission is to support the independence and dignity of elders and individuals with disabilities by providing essential information and services that promote healthy and safe living. The agency has 169 employees and operates more than 15 programs serving elders, individuals with disabilities, their families and caregivers. 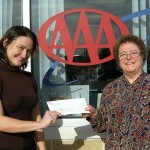 For more information call (508) 584-1561 or visit the website at www.oldcolonyelderservices.org.